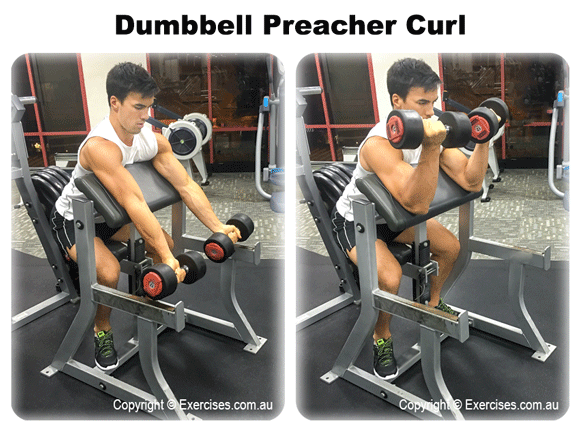 Dumbbell Preacher Curl is an effective exercise for isolating the biceps but also works the forearms as well. Dumbbell Preacher Curl targets the long head of the biceps which is responsible for its size and shape. As an isolation exercise it is better to use light weights when doing Dumbbell Preacher Curl and focus on proper form and technique. Set an incline bench to a 45 degree angle. Pick up a dumbbell and place your elbow on the pad of the incline bench. Position your armpit close to the edge of the incline bench. Rotate your body toward the same side of the curling arm. Lean back slightly so your body can have stability. Brace your other arm on the edge of the incline bench for support. Start the curl with the dumbbell at the top position. Take a deep breath, exhale then resist the weight and bring your arm down to the pad of the incline bench. Stop short of full elbow lockout; flex at the elbow then curl the dumbbell back to starting position. At the top position, squeeze your biceps as hard as you can and hold the position for a count of “one”. Resist the weight as you bring your arm back down to the bottom position. Once you have completed the targeted number of reps for one arm, switch and work on the other arm. Perform the exact number of reps. Maintain a slight bend in your elbow to prevent it from over-extending and to keep constant tension on the biceps. Curl the dumbbell to a point where you can get the strongest contraction. Do not let the dumbbell touch the shoulder because you may lose constant tension.